Fiction – paperback; Myrmidon Books; 448 pages; 2012. Review copy courtesy of the publisher. Tan Twan Eng’s The Garden of Evening Mists has been shortlisted for this year’s Man Booker Prize. It is a beautiful tale set in the central highlands of Malaya about memory, forgetting, war, politics, atonement, redemption, forgiveness, gardening — and the Japanese art of horimono tattoos. The story revolves around Teoh Yun Ling, the sole survivor of a secret Japanese slave-labour camp, who takes early retirement from her career as a judge at the Supreme Court in Kuala Lumpur. For the first time in almost 35 years, she returns to Yugiri, in the Cameron Highlands, where the beautiful Japanese garden called “Evening Mists” is located. Six tall, narrow stones huddled into a miniature limestone mountain range in the centre of the pond. On the opposite bank stood the pavilion, duplicated in the water so that it appeared like a paper lantern hanging in mid-air. A willow grew a few feet away from the pavilion’s side, its branches sipping from the pond. It was here, during the Malayan Emergency, that she met the garden’s designer, Nakamura Aritomo, and tried to convince him to create another Japanese garden as a tribute to her sister who died in the camp. Aritomo, the exiled former gardener of the Emperor of Japan, declined, but he agreed to take her on as an apprentice so that she could learn the necessary skills to create the garden herself. From this narrative thread, other narrative threads begin to spool out, including: Teoh’s time in the slave-labour camp; her years living on the Majuba Tea Estate in the Cameron Highlands (where the threat of murder and kidnap by communist guerrillas put her life in constant danger); and her present situation in which she tries to fob off an historian, Professor Yoshikawa, seeking permission to use Aritomo’s artworks (woodblock prints) — now in her ownership — in a book he is writing to prove his hypothesis that the emperor’s gardener was also a tattoo artist. These threads are told in a kind of random fashion, because they are revealed in a memoir that Judge Teoh is hurriedly writing before the illness with which she has been diagnosed leaves her unable to read or write. That illness is just one of many pieces of information she withholds from her friends. As the narrative gently unfurls we discover more of these secrets. It is not that she is an unreliable narrator, but that she only tells you what she wants you to know when she wants you to know it. As a result this is a novel full of surprises. It is also a novel fully of mystery. I don’t think it’s a plot spoiler to say that midway through the novel Aritoma disappears — and no-one knows what happens to him. If he was enigmatic in life, he is even more enigmatic in death. There’s also the curious notion of how Judge Teoh managed to escape from a camp that no-one has ever heard of and one that even she cannot locate. And why does the Majuba Tea Estate seem immune to the war raging between the British and the Malayan nationalists — exactly which side is the owner on? 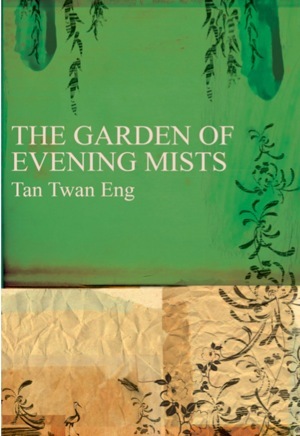 The thing I most loved about The Garden of Evening Mists was the way in which Tan Twan Eng describes the garden and the art of creating it. I admit that I am a sucker for Japanese gardens, having learnt about them at university (as part of my studies in landscape architecture) and he brings to life their beauty, elegance and symbolism in an incredibly visual — and sensual — way. And Judge Teoh is a wonderful creation; a Straits Chinese woman who hates the Japanese for what they did to her (and her sister) in the camp, but is able to put that aside to work closely with a Japanese man — even though his very presence reminds her of what it was like to be “a prisoner of the Japs”. Sometimes the narrative falls into a slight lull, but the multi-layered storylines provide sufficient intrigue to maintain the reader’s interest. Despite the gentleness of the prose, this is a book about extreme violence and cruelty in all its many facets. But it does not paint things in black and white. This is a book full of light and shade, with the garden as its central focus, for it is the act of building the garden which helps heal the psychological wounds of both Judge Teoh and Aritomo. Later, it becomes a refuge, a place of solace, from the war happening in the hills beyond, and later still, it provides comfort to an ill woman trying to make sense of her extraordinary life. Of the ones listed, this is one that has a lot of appeal & one that I will read at some point. I’ve read two others off the list — Swimming Home and The Lighthouse — and I have to say this one is probably my favourite. I really, really liked this novel. The whole prize thing is a bit silly, but this is a deeply enjoyable read, very atmospheric and a wonderful meditation on loss. Sorry to nitpick, but the Japanese gardener is Aritomo, not Aritoma. I reviewed this book a few days ago. There were a lot of mystery behind the book. What do you think happen to the Aritomo? Do you think he can’t live with what his country has done that he decide to….? I am a bit antsy when I don’t see an answer at the end of the book. I hope this one win on Tuesday. On my ‘silly’ comment: given the diversity of the shortlisted books, I don’t think there are any sound criteria on which you could say one is ‘better’ than another. How do you compare, say, this book and Mantel’s ‘Bring Up the Bodies’? The genres are completely different and while some people will read both, there will be readers attracted by one but not the other. This is not a measure of whether one is superior, but rather a choice about one’s preferred type of book. Still, prizes mean money and extra sales, so they are not going to go away. And the reader who dropped you for talking about the Booker? Well, that certainly is silly! So this would be your pick then? Congratulations on reaching 700 reviews!!! Our ratings match for this book as well! I thought the mix of light and shade were fantastic. I really hope it wins the Booker Prize tomorrow. Suspect you’d rather like this one, Lisa. It’s quite a contemplative read, but deals in some very big issues. It inspired me to find out more about the Malayan Emergency — my ignorance was shameful! I’d be very happy to see this one win, but I’d be just as happy to see The Lighthouse win, too. But, as you suggest, I suspect that Umbrella may just walk away with the prize, because it’s clearly the most ambitious novel on the list. Many thanks, bubba! Not sure many people noticed that… although I did flag it up on Facebook & Twitter. Hi Jackie… I need to catch up with your blog. Glad to hear you enjoyed this one. I’d like to see it win, too, but I’d be just as happy if The Lighthouse took the prize. I know what you mean. I finished the Phantom of the Opera and it feels like the Phantom is going to live on as well! I love the book. I fancy this one, but it doesn’t feel like one I want to rush out and get (I am just back from the library where I grabbed The Lighthouse as your recommendation pushed me over the edge) so maybe I should pick this one up if it ever ends up in the library shelves too as it does sound like with all its mysteries I might like it more than I think. You were right, Kim, I did enjoy this one:) Will it win the Man Asian Lit Prize, for which it’s been shortlisted? We’ll find out in March….